salad of zucchini ribbons tossed with toasted sesame seeds and crackling strips of nori (dried seaweed). Be sure to serve this zucchini salad as soon as it's ready because it can get watery while it sits. 1. If using white sesame seeds, in a small skillet, toast them over moderate heat until golden brown, about 3 minutes. Transfer to a plate to cool. 2. 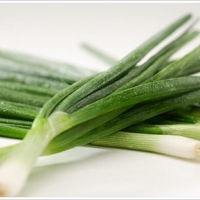 In a small bowl, whisk together the miso paste, soy sauce, scallions, rice vinegar, lemon juice, sugar and chile. Whisk in the olive oil and stir in the cilantro; season with salt and pepper. 3. Using a mandoline, cut the zucchini lengthwise into paper-thin slices. In a very large bowl, toss the zucchini with the dressing. Transfer to a platter. Scatter the nori and toasted sesame seeds on top and serve right away. MAKE AHEAD The miso vinaigrette can be refrigerated overnight. NOTES The easiest way to julienne the nori is with a pair of scissors. I love all of your inventive zucchini recipes! I have to remember to come back to them at the end of the summer when I'm swimming in zucchini from the garden. This sounds absolutely delicious! Was wondering, though, if you might have a suggestion for an alternate to cilantro?